In recent weeks, the President of the Global Labor Organization (GLO), Klaus F. Zimmermann (UNU-MERIT, Maastricht University & Bonn University) has been on a contact tour through Europe for talks, research seminar presentations and policy debates. February 14 – 17, 2018: Nicosia and the University of Cyprus to study the border situation and intensify university connections. See for more details. February 21-22, 2018: Glasgow/Scotland and the University of Strathclyde. Contacts and Research Seminar presentation of Zimmermann on Arsenic water consumption and wellbeing in Bangladesh on the invitation of GLO Fellow Robert Wright and Markus Gehrsitz. February 26, 2018: Austrian Federal Economic Chamber, Vienna/Austria: Conference on the “The European Labor Market – between Unemployment and Shortages of Skilled Labor”. Zimmermann gave a speech on “Challenges and Chances of the free European Mobility of Workers” and participated on a Plenary Panel about the labor markets of Austria, Poland and Romania. Many interactions, among others with Christoph Leidl, the President of the Austrian Federal Economic Chamber, and GLO Fellow Rainer Münz (European Political Strategy Centre, European Commission, Brussels). See for more details. February 27, 2018: Policy Panel in Vienna/Austria of DIE WEIS[S]E WIRTSCHAFT in the Press Center Concordia on Migration and Integration Policy of the new Austrian Government. Panel organized by GLO Fellow Peter Brandner. Zimmermann discussed among others with GLO Fellows Robert Holzmann and Manfred Deistler. See for more details. March 1 -2, 2018: St Petersburg/Russia. 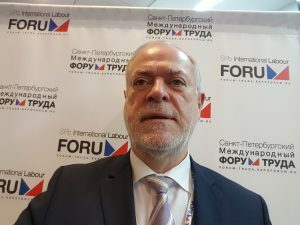 Zimmermann spoke on the Second International Labour Forum of the Government of St. Petersburg on “The design of effective labor market policies“. See for more details. 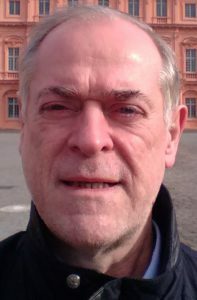 Below: Zimmermann in St Petersburg, Russia.